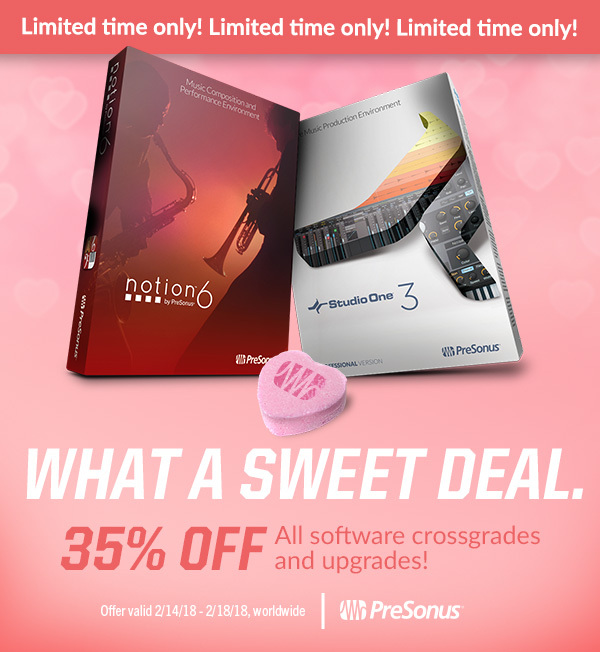 We would love for you to get Studio One 3 Professional or Notion 6 for 35% less this Valentine’s Day! If you’re running Studio One 3 Artist, Notion 5, or maybe even Studio One version 1, this is a great, inexpensive time to get up to speed with Notion 6 or Studio One 3 Professional. Or both, with some money left over to spend on the sweetheart of your choice. What if you’re not running Notion OR Studio One? 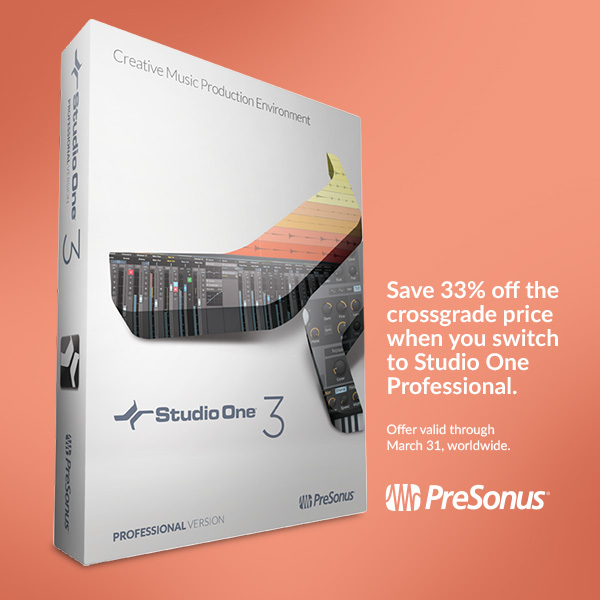 Well, we still like you, and you can switch to PreSonus for a lot less money with a discounted Crossgrade. The already low Crossgrade price has been dropped by 35% in this sale, as well. If you’re interested in a crossgrade from your existing DAW, all you need to do is find a local dealer, online dealer, or contact PreSonus directly with a copy of the UPC code or original purchase receipt for the other DAW in an email to crossgrade@presonus.com. Hurry, this offer ends Feb. 18, 2018! What’s a Crossgrade, you ask? It’s a way for users who have already invested in another DAW to switch to Studio One for less money! And even better: until March 31 2018, we’re lowering the existing crossgrade price by 33%! This brings the price down from $299 to $199 USD; regional discounts will vary by a small amount. To get the Crossgrade, all you need to do is find a local dealer, online dealer, or contact PreSonus directly with a copy of the UPC code or original purchase receipt for the other DAW in an email to crossgrade@presonus.com. Hurry, this offer ends March 31, 2018! Start off 2018 with 30% OFF the Woodwind Bundle for Notion! 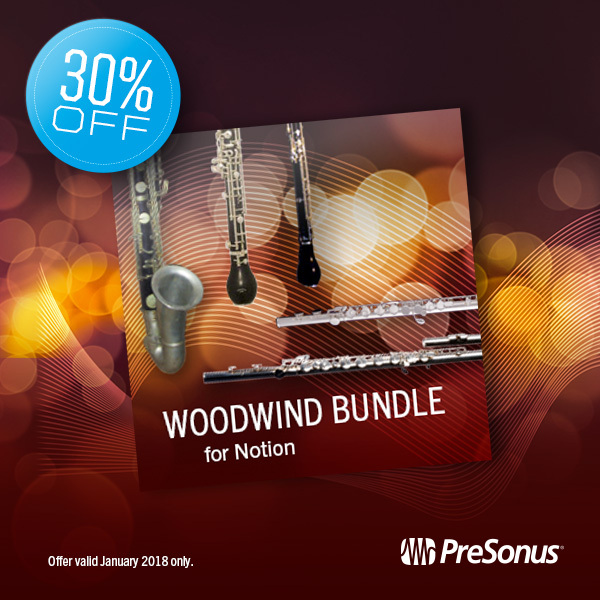 For the month of January , purchase the Woodwind Bundle for Notion for 30% off right out of the PreSonus Shop. All of which were performed and recorded by principal and second players from the London Symphony Orchestra at Abbey Road Studios in London. These sounds are only compatible with Notion version 5 or higher! Comments Off on Start off 2018 with 30% OFF the Woodwind Bundle for Notion! Studio 192 and Studio 192 Mobile Discounts! 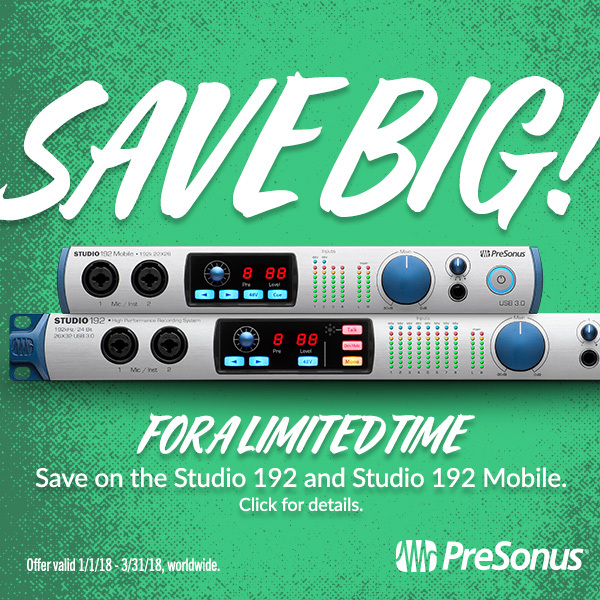 The Studio 192 and 192 Mobile rank among our most versatile interfaces, offering incredibly high sample rates for their price and robust monitoring and connectivity options. And until the end of March 2018, they’re available for a lot less money. Hook up a Studio 192 family interface to a laptop with the included Studio One DAW, and you’ll have remote software control of the preamp levels on the interface, eliminating the need to constantly get up from your seat and tweak while establishing levels. You’ll be capturing those levels in sterling 192 kHz. As your needs grow and you find yourself needing more inputs, the Studio 192 interfaces are expandable via additional hardware like the Digimax DP88. Add to that advanced monitoring capabilities, word clock, and S/PDIF, and you’ve got a powerhouse in a small package. Outside the US? Click here for your local distributor. Comments Off on Studio 192 and Studio 192 Mobile Discounts! The ULT active loudspeakers combine the widest horizontal dispersion of any loudspeaker in their class with a focused vertical dispersion for an ultra-long throw. The result is even coverage throughout the space, enabling the audience to hear clearly wherever they are. 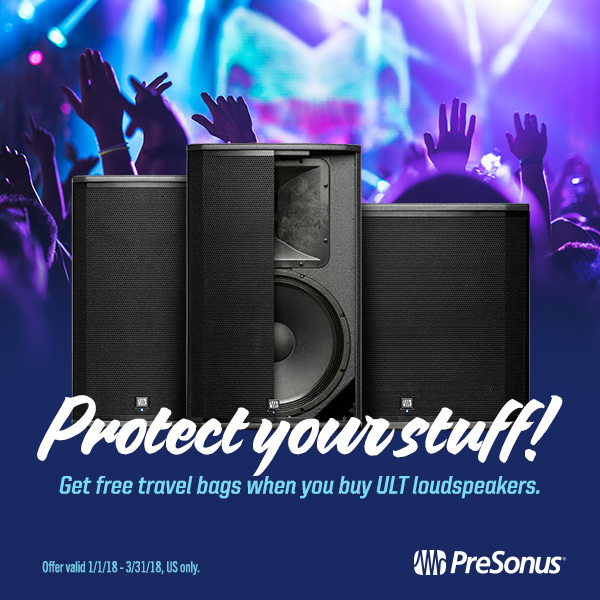 Featuring PreSonus’ proprietary Pivot X110 horn, a custom 12-inch low-frequency driver, and plenty of biamped Class D power in a lightweight design with the performance characteristics that only wood can offer, ULT loudspeakers deliver first-rate speech intelligibility and natural music reproduction. This makes them a great choice for both mobile use and permanent installations. This offer is available to customers in the USA. Click here to get the required form. 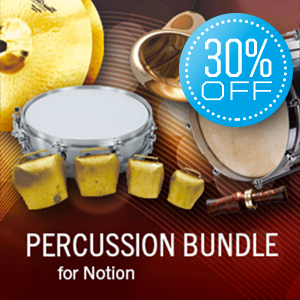 The Percussion Bundle is the percussionist’s toolbox. The entire Notion Percussion bundle is a palette of drums, rhythm shakers, cymbals, noise makers and sound effects from around the globe. The entire bundle is available in this single convenient download, or you can pick and choose from the various collections available in the bundle. Get just the sizzle cymbal, bongo, or duck call that works just right for you and your project—for 30% less! Tenor Drum, Side Drum, Piccolo Snare, Long Drum, Bongos, Bongos w/ Sticks, and Bodhran. The drum samples were played by Neil Percy of the London Symphony Orchestra. Splash Cymbal, Finger Cymbal, Sizzle Cymbal, and Chinese Bo. The cymbal samples were played by Neil Percy of the London Symphony Orchestra. Hand Clap, Champagne Bottle, Church Bell, Car Horn (low & high), Siren, Thunder Sheet, Wind Machine, Lead Pipe (low & high), Flower Pots, Hammer, Lion’s Roar, Cuckoo, Referee Whistle, Duck Call, Train Whistle, and Nightingale. The effects samples were played by Neil Percy of the London Symphony Orchestra. Tuned Gongs, Almglocken, Saw, Hand Bells, Wine Glasses, Whistling, and Whistling (Vibrato). The pitched percussion samples were played by Neil Percy of the London Symphony Orchestra. Cuica, Ocean Drum, Log Drum 1, Bodhran, Slide Whistle, Anvil, Sand Blocks, Rainstick, Drum Sticks, Agogo (low & high), Brake Drum (low & high), Ratchet (low & high), Whip Flexatone, Vibrastick, Vibraslap (low & high), Water Gong, and Bell Tree. The percussion samples were played by Neil Percy of the London Symphony Orchestra. 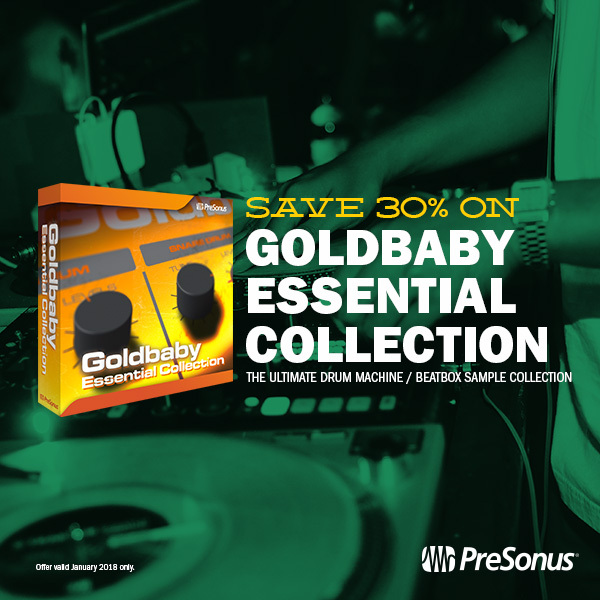 These Add-ons, available at shop.presonus.com, have been meticulously modeled from many hard-to-find plate reverbs, spring reverbs, and digital reverb processors from across the globe. We can’t really overstate what a significant undertaking this was! 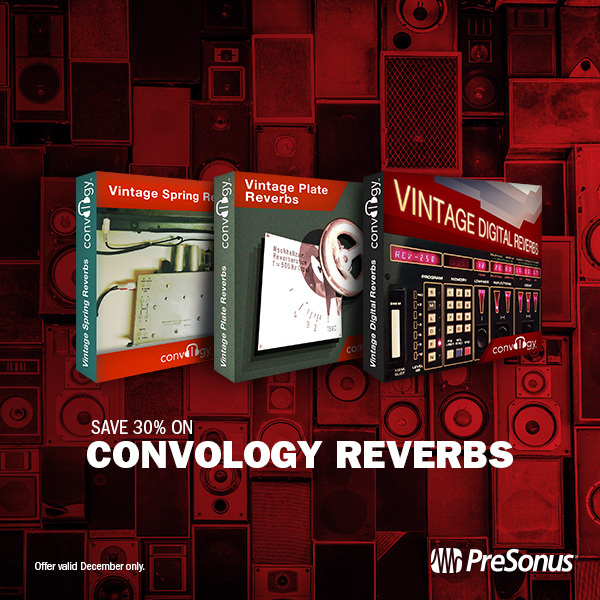 The Convology Vintage Reverbs are available in a bundle pack, as well as individually, and all of them are on sale for 30% off in December 2017.